Currently, Jess works for Anthropologie’s home office in Philadelphia, PA as a home stylist. Her day-to-day includes working with customers online to design and style their homes! Jess’ favorite projects to date have been designing photographer Gray Malin’s L.A. living room and food blogger Half Baked Harvest’s studio barn. Aside from her job with Anthropologie, Jess started her own blog in 2016 called Jess Morse Interiors dedicated to translating technical interior design knowledge into actionable blog posts for the everyday homeowner. She loves showcasing her interior aesthetic in these posts, which is an eclectic mix of vintage, bohemian, farmhouse, and mid-century styles. Looking for one-on-one design advice from Jess? Visit the contact page on www.jessmorseinteriors.com and find her tips on Instagram @jessmorseinteriors. 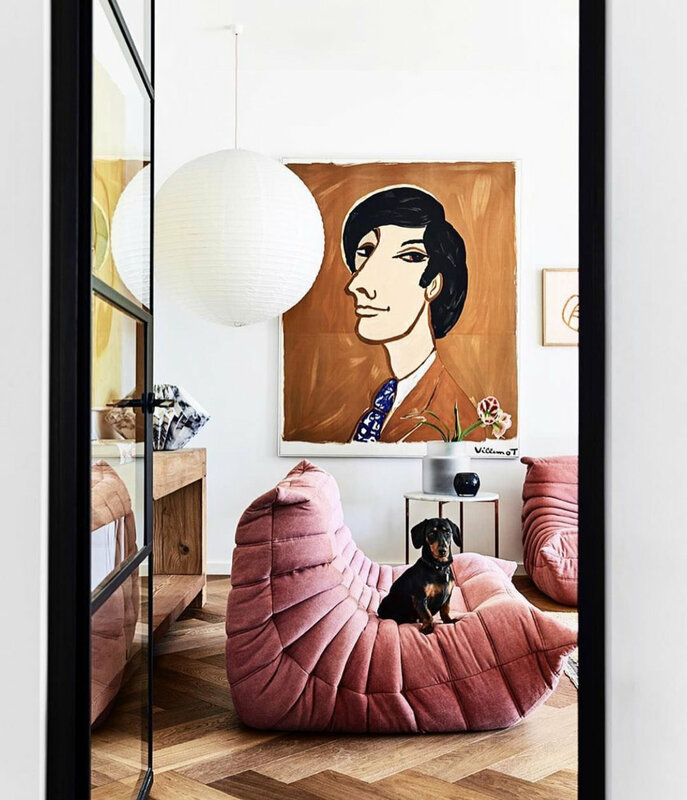 I personally am still enamored with the 70s inspired designs that gained popularity recently—you can expect to see more of this decade’s influence as well, through design elements like curvy furniture and earthy neutrals. Maximalism is a trend that embraces bold wallpaper and paint colors, spaces filled to the brim with furniture, and (gasp!) clashing colors. This trend is about doing what you love, even if it goes against a design rule or having a perfectly styled room. To me, maximalist spaces feel lived-in and a bit more realistic than their minimalist counterparts. Although I tend to be a fan of neutral spaces myself, I truly think this trend will fill a much-needed void in the interior design world. Designers and homeowners alike are craving bold, colored spaces and furnishings that are functional as well as beautiful. Go ahead and experiment with that floral wallpaper, pink sofa, and mix those prints! Photo by Brit + Co.
After a few years of countless au naturel spaces with lots of white, designers are craving something a bit bolder. A chic way to use dark hues in a living room, for example, is to select a paint color that is the same as your sofa, but just a shade or two; this has a gorgeous monochromatic effect! If you live in a home with minimal natural light or one that has a small footprint, and painting your space a dark hue makes you slightly nervous, check out my previous blog post that debunks this myth that says you cannot paint small spaces dark colors! Various metals have come into the spotlight over the past few years, such as brass and copper. While we have seen trends shifting away from using copper as a primary metal, I believe brass is here to stay. In 2019, you can expect to see designers creating spaces that mix metals, meaning they have various finishes within one room. There are a few tips to mixing metals correctly: First, I’d suggest using no more than 2-3 metals in a room. Next, try to keep the places you use a certain finish consistent. For example, if you’re renovating a kitchen, you could choose brass hardware and faucets, then experiment with a chrome finish for your light fixtures and bar stools. This will keep the eye from jumping around and will ultimately lend itself to a cohesive feel, as opposed to scattered and random. Large-scale artwork, in my opinion, is the response to the gallery wall trend that has inundated our Instagram feeds in recent years. Once a fad has become so big, I find that within the next couple years, we tend to see the opposite start to come into the spotlight. While I am a fan of a gallery wall from time to time, I do think it is time to switch it up a bit! Large-scale artwork is a perfect solution for decorating a space, but it is not always practical or plausible. Another, more budget-friendly approach is hanging a large textile (you can find these cheap at flea markets) or even removable wallpaper to fill up an oversize area, which is a great way to make a statement in place of art.